We will be going back to Casini Ranch, but taking over more shaded spots than the spots we had this past year. 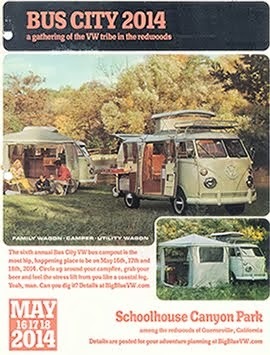 Price will be $40 for 2 nights of camping. To reserve your spot - sign up and pay by March 1st, 2010. (NOTE: THERE ARE STILL A FEW SPOTS AVAILABLE!! Either email me, at BigBlueVW (at) gmail.com or use the handy paypal function below. And - now you can pay online - ahead of time. Just click on the "Buy Now" icon below to pay via PayPal. Bus City 2009 was a success with 13 buses showing up. 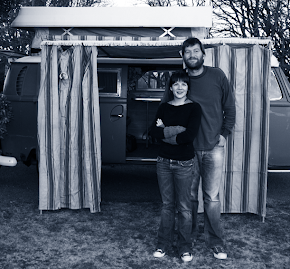 We had a great time despite the rare Sonoma heat wave. 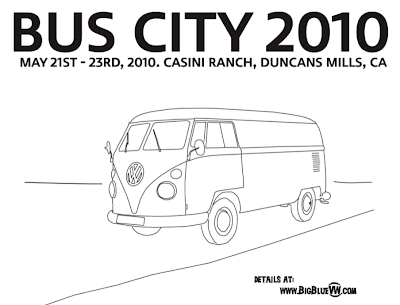 To see pictures from Bus City 2009, click here. For a video, click here. $40 for the 2 nights. Cost covers the site. You are on your own for booze, water, food and Doritos. There is a store at the ranch, but there's no guarantee that they'll have the snacks you like so come prepared. 1. Stumptown Brewery is nearby. Great back deck to enjoy lunch and a beer on. 2. The Pink Elephant. Looks like a crazy bar, but a great place for a cold drink and a game of pool (I haven't had the pizza, but everyone says it's great). 3. The town of Guerneville is close by. 4. The small town of Duncans Mills has some antique shops. 5. Canoe places are all over to rent canoes for a Russian River adventure. 7. To the west a short drive, the Russian River dumps into the Pacific in the town of Jenner. 8. Can't get enough tie dye? Stop at the vendor in Rio Nido who sells homemade tie died stuff out of his old split window VW bus. 9. Sit back, have a Miller High Life, and enjoy the weekend with your bus friends. 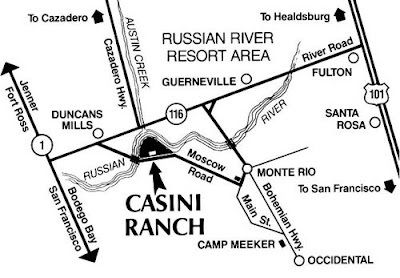 Take River Road Exit west to Russian River Resort Areas and Guerneville (go approx. 18 miles). At Guerneville continue straight onto Hwy 116 to Duncans Mills (another 8 miles). Turn left onto Moscow Road, cross river and continue to entrance (3/4 mile). Take Hwy 116 south of Jenner toward Russian River Resort Areas. Continue upriver 4 miles to Duncans Mills and turn right onto Moscow Road, cross river and continue to entrance (3/4 mile). The Tie Dye vendor you speak of is located in Monte Rio at the 3-way stop sign, not this fictional place you call Rio Nido.